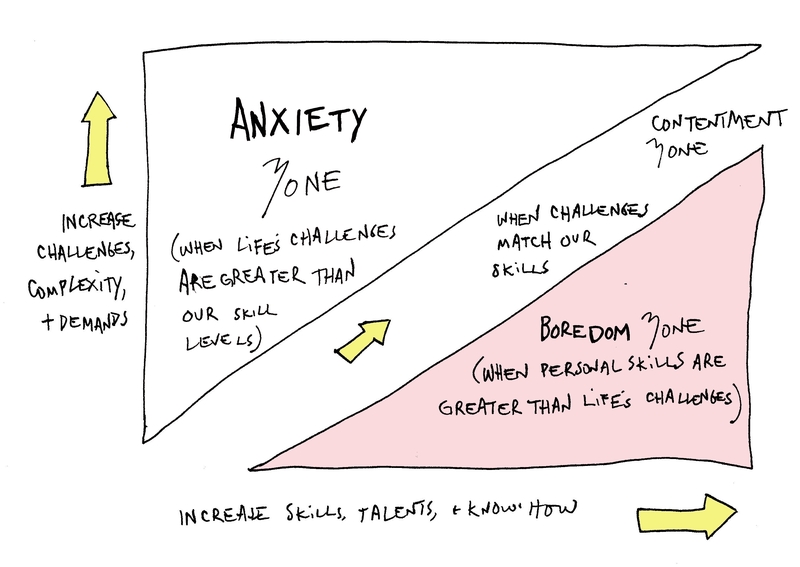 Do we all need to be in the “flow” or “zone” ? Are you seeking to be in the “flow” or “zone” and find peak performance? Are you sufficiently challenged and “growing,” or has boredom set into your life, relationships, work etc. As human beings we need the optimum degree of challenge. If we have too many things to do and we become frazzled, stressed, anxious; (I am not discussing Social Anxiety, which is a topic for another post) or having to do things beyond our capability leads to stress. If we have too few challenges and we suffer from boredom. It is this boredom that we sometimes try to remove by doing “exciting things,” be it travel, drugs or other “recreational” activities (or hedonistic activities) or by buying new cars, things and objects. The problem is that we then habituate to these toys and need another “new thing” to get the buzz. This is not just a challenge for the young but equally well for the old. In one study at a Care Home, they gave two groups of residents a plant. In one group they asked them to “look after” the plant and in another they told the other group that the plant would be watered etc by the staff. Those that were involved in looking after the plant lived longer. Work (as we spend so much time at it) ultimately has to be challenging and engaging and enriching if one is to create a positive work environment for one’s team. Giving people challenging work and responsibility is part of a manager or leader’s responsibility also. If this post has sparked your interest to know more, here are some links you might enjoy.